David Longly Bernhardt (born August 17, 1969) is an American attorney, lobbyist and politician. He is the 53rd and current United States Secretary of the Interior since 2019. He was the Deputy United States Secretary of the Interior when Ryan Zinke was secretary. He began working for the United States Department of the Interior in 2001 and was the department's solicitor from 2006 to 2009, among other roles. On April 28, 2017, President Donald Trump nominated him to be the United States Deputy Secretary of the Interior. He was confirmed by the U.S. Senate on July 24, 2017. He became Acting Secretary of the Interior on January 2, 2019, replacing Ryan Zinke. In February 2019, Trump nominated Bernhardt to serve the position as the permanent secretary. He was confirmed on April 11, 2019. ↑ Soraghan, Mike (November 18, 2005). "Colo. lawyer tapped for Interior post". Denverpost.com. Retrieved May 13, 2017. ↑ Soraghan, Mike (December 4, 2006). "Interior lawyer knows Colorado". Denverpost.com. Retrieved May 13, 2017. ↑ "Trump taps former Bush official for key Interior post". The Hill. April 28, 2017. Retrieved May 13, 2017. ↑ Paul, Jesse (July 24, 2017). "Colorado's David Bernhardt, Trump's nominee for Interior Department post, is confirmed by Senate". The Denver Post. Retrieved July 26, 2017. ↑ "Trump to nominate ex-energy lobbyist Bernhardt to head Interior". Reuters. Retrieved February 7, 2019. 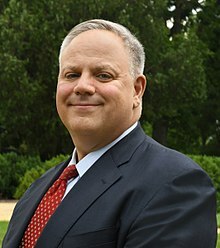 ↑ "PN503 - Nomination of David Bernhardt for Department of the Interior, 116th Congress (2019-2020)". www.congress.gov. April 11, 2019. Retrieved April 12, 2019. This page was last changed on 22 April 2019, at 07:39.